The Amelia Douglas Gallery’s newest exhibit takes gallery visitors through four distinct series of artworks, each inspiring viewers to consider their relationships with the world and its inhabitants in different ways. Inhabited Lives, featuring the prints, paintings, and other mixed media works of artist Shannon Harvey, opened in the gallery on September 14. As Harvey told the Other Press in an interview at the exhibit’s opening reception, the four series of works encompass most of what she has produced over the past six years, and she’s excited to have the large space of the gallery to display her art. The Underground series is a set of abstract acrylic and ink paintings that Harvey started about six years ago, after Harvey’s daughter was born. Creating these pieces was the artist’s way of working through the emotions of being a new mother, although she didn’t fully realize this connection until later. Harvey said she doesn’t often work in abstract, so she found the experience of creating these pieces freeing because of how viewers can approach the art through their own interpretations. Some works, such as “Mother and Child,” clearly invoke the idea of motherhood; others are less explicit, such as “Gyre” with its bold lines and swirling patterns. Yet all of the pieces in the Underground series convey a sense of free-flowing life. The Animal Icons series is less abstract, but no less impactful. This group of prints explores the relationship between humans and animals and the question of raising animals ethically for food and other human purposes. The prints show small-scale farmers and other individuals working humanely and respectfully with animals, such as Joe Wasp, a man who performs ethical relocations of bee and wasp nests. Harvey said the style of this series was heavily inspired by old Polish posters of the ’50s and ’60s. The prints are all mainly black and white, with only one or two areas of colour that accentuate the intricate textures of the works. Although Harvey is not vegetarian or vegan herself, she strives to prompt a reconsideration of our interactions with our food. “We’re very close with these animals, and yet we’re eating them too,” she said to the Other Press—a paradox that her art calls into question. Another series of works, China People Street, was directly inspired by Harvey’s walks through Chinatown in Vancouver. 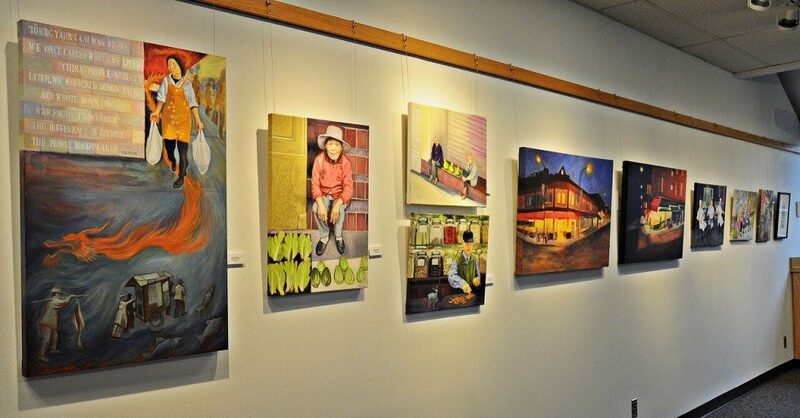 It’s an area full of, rich history and unique character, depicted through the artist’s vivid acrylic paintings of elderly residents and street-level activity. Harvey lives very near Chinatown, in Strathcona, so she’s witnessed the area change intensely over the past few years. Architectural development, demographic shifts, and cultural change have led to a profound transformation of the neighbourhood. Harvey’s paintings are her attempt to memorialize some of this distinctive spirit before it is completely eroded by new developments. “It speaks to a neighbourhood that has very deep roots… and I just felt like I wanted to capture that before it disappears,” said Harvey. Her most recent artistic series is We Could Be Heroes, containing portraits of people whom Harvey finds inspirational, such as Cindy Blackstock, a local First Nations activist known for her advocacy in Aboriginal children’s welfare. She told the Other Press she didn’t originally intend for We Could Be Heroes to show only women, which all three of the works so far do. “I realized that I did [focus on women] as it was happening, and I was thinking, ‘Actually, you know what? That’s okay,’” she said. Harvey plans to continue with this series, and she doesn’t know if she’ll end up including any men; if not, she is happy to recognize and celebrate the many powerful women who are leading movements and inspiring change around the world. Inhabited Lives is currently on display in the Amelia Douglas Gallery, located on the fourth floor of the New Westminster campus. The exhibit will run until October 21.